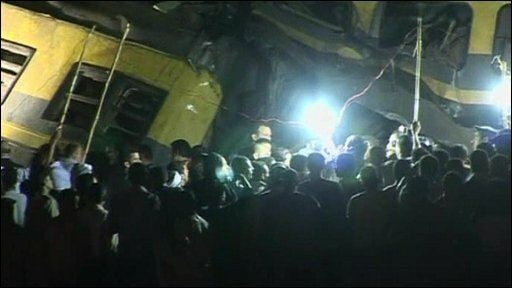 Rescuers using heavy lifting equipment have untangled the wreckage of two passenger trains which crashed near Cairo, killing at least 18 people. Officials said at least 50 people were also injured. The trains collided at Al-Ayyat in Giza, 50km (31 miles) south of the Egyptian capital. The accident happened when a train heading to Fayoum stopped after apparently hitting an animal, and a second train went into the back of it. The second train, destined for Assiut in upper Egypt, badly damaged its front carriages on impact, crushing the rear carriages of the train in front. The military was brought in to help emergency services work through the night searching for bodies and injured passengers. Subsequent pictures from the scene showed the mangled wreckage of the two trains moved from the track by heavy lifting machinery. Eyewitnesses described how the first train made the unplanned stop after hitting an animal. One eyewitness, named only as Mohammed, said: "The train hit a water buffalo. The gas pipeline broke, and the train stalled. The other one came from behind quickly and hit it. "The people at the doors all fell, and people fell beneath the train tread." Resident, Samhi Saleh Abdel Al, told AFP: "I was sat near the road... when I heard a deafening screeching, then shouts and I saw passengers jumping from the train". Egypt rail network has a long history of rail accidents. The most deadly occurred at Al-Ayyat in 2002, when a train fire left more than 370 people dead. More recently, dozens were killed when a train crashed into vehicles at a level crossing north-west of Cairo in July 2008, and more than 50 died when two commuter trains collided near the capital in August 2006.